Preheat oven to 400 degrees. Combine the flour, cornmeal, baking powder, sugar and salt in a medium bowl. Add the milk, shortening and egg and mix only until the ingredients are well combined. Pour the batter into a greased 8 x 8 baking dish. Bake for 25-30 minutes or until the top is golden brown. 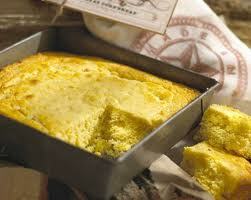 Let the cornbread cool slightly before slicing it with a sharp knife. For the honey butter, use a mixer on high speed to whip the butter and honey together until smooth and fluffy. NOTE: Growing up in southern California, our family loved going to Marie Callendar’s for a special treat after church. Along with their famous Strawberry Pie, they always served this delicious, sweet style cornbread with the honey butter at their wonderful restaurants. This recipe can easily be doubled and baked in a greased 9 x 13 baking dish. You will need to extend the baking time by about 5 – 8 minutes. It is delicious served with chili, soups and BBQ. We recently featured this recipe at Adrians 2011 Spring Open House. Enjoy! We LOVE to hear from you! Please take a minute and leave a comment in the box below. Thank you!